Have you ever noticed how everything changes when you are exhausted, burned out or in a foul mood? Even little things get under your skin, you get stuck in traffic, spill coffee on your white shirt, forget your reading glasses ... it all happens on the same day and it is distinctly crazy-making. Have you ever experienced that? In this article let me show you the latest functional MRI brain research on the basis of the Eeyore Effect and and give you an extremely simple way to turn it all around. 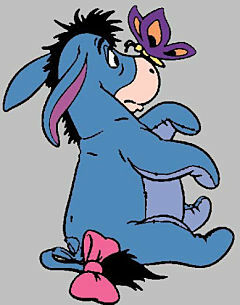 He is the donkey in the Winnie the Pooh books who is always losing his tail. He is forever in the dumps, a dyed in the wool pessimist. "Oh well, I lost my tail. I guess this is going to be another lousy day". And then he has another lousy day. That happens to us too. 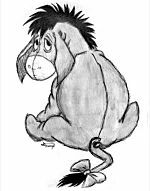 If you wake up exhausted, in a foul mood or especially if you have been struggling with physician burnout recently, this Eeyore Effect can drag your whole day downward. It is the opposite of the traditional "rose colored glasses". On these bad days it is as if you have sh*t colored glasses on ... so everything looks like sh*t.
We now have functional MRI evidence of brain changes behind this downward spiral experience. The functional connectivity between the amygdala and the anterior cingulate cortex correlated with the ability to down-regulate negative emotion. This connectivity was significantly weaker in the burnout group, as was the amygdala connectivity with the dorsolateral prefrontal cortex and the motor cortex, whereas connectivity from the amygdala to the cerebellum and the insular cortex were stronger. In subjects suffering from chronic occupational stress, the functional couplings within the emotion- and stress-processing limbic networks seem to be altered, and associated with a reduced ability to down-regulate the response to emotional stress, providing a biological substrate for a further facilitation of the stress condition. Here is a quick way out of the downward spiral and a story to illustrate the power of this tool. Realize that having a good day is a choice. A good day is not something you manufacture or will into existence as in, "I am going to make this a good day". A good day is a choice, as in "today IS a good day." Even if yesterday and the day before that and the day before that were bad days, when you wake up tomorrow go ahead and say it out loud, "Today is a good day" and watch how it changes your experience. If you scoff at this advice, are absolutely certain it won't work or are fighting mad at my suggestion and want to argue with me that your life really IS sh*t ... then you may be dealing with physician burnout rather than garden-variety Eeyore Effect. If that is the case a Discovery Session with one of our coaches is your best next step. Way back in 2001 when I was commuting an hour into Seattle each day for my coach training, I first learned about "happiness is a choice" and the technique of deciding today is a good day. I woke up one day and said out loud, "today is a good day," and here is how that day rolled out. My drive into the city was about an hour on a three lane highway (I-5) and I had a Toyota pickup with 200,000 miles on it. I was in the fast lane, in stop and go traffic when all the lights on the dash went on (all of them red of course) and the engine died while I was rolling at about 5 mph. I had a brief vision of coming to a stop in the fast lane and how that was going to be a sh*t show, when a gap opened up in the concrete jersey barrier on my left just big enough for the truck. With my last 10 feet of inertia I rolled to a stop tucked to the left of the fast lane in one of those little pockets where the cops set up their speed traps. Said to myself, "how am I going to get a tow truck from here in the middle of the freakin' highway" (no cell phone) and when I opened the door, stood up and looked back into the traffic there was a tow truck six cars back in the middle lane already coming my way with his turn signal on. He took me to a car repair shop four blocks away where they asked, "Would you like a rental car and a tune up in addition to us fixing what we find?". It had been several years since the last tune up and I still needed to get to the city for coach training, so that was "yes and yes, please". The rental people came and got me, popped me in a snazzy little Chevrolet and I arrived at my all-day class just 15 minutes late. On the way home I picked up my fixed up and tuned up car and thought to myself, "I sure am glad all of this "bad stuff" happened on a Good Day!" Try making a choice to have a good day every day this week and then LEAVE A COMMENT on how it goes for you.